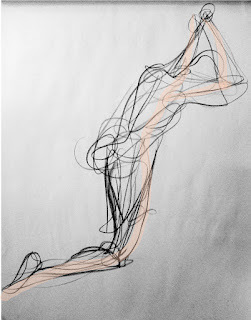 It's called gesture drawing, and I never really thought about it as being anything remarkable. I thought of them as warmups, just something to do before going to work on the "real" drawings. I generally didn't even bother to bring them home, I just pitched them in the recycle bin at the school. Then, two things happened. (1) Earlier this summer, I was at a group show where folks had framed their gesture drawings, put price tags on them, and hung them in a gallery; and (2) I found out that there are students - full-time art students in their final year at Sheridan, so people who know their stuff - who list gesture drawings as one of the most frustrating and difficult things to do. At this point, I'm thinking to myself, "Dang, I gotta start keeping some of that stuff." So I'm learning to respect the fine art of scribbling. And in the drawing department, there are a couple of things I think I'm pretty good at, and gesture drawing is one of them. Not that I have any special talent, this is a skill that anyone can develop if they practice at it, and put down a few hundreds of these. 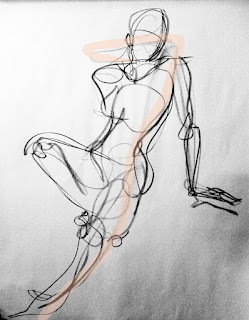 When I'm doing a gesture drawing, I start with a few seconds of observation, to get a feel for the pose, about what it would feel like to be in that pose, where the tension is, where the weight is, and where the energy is. 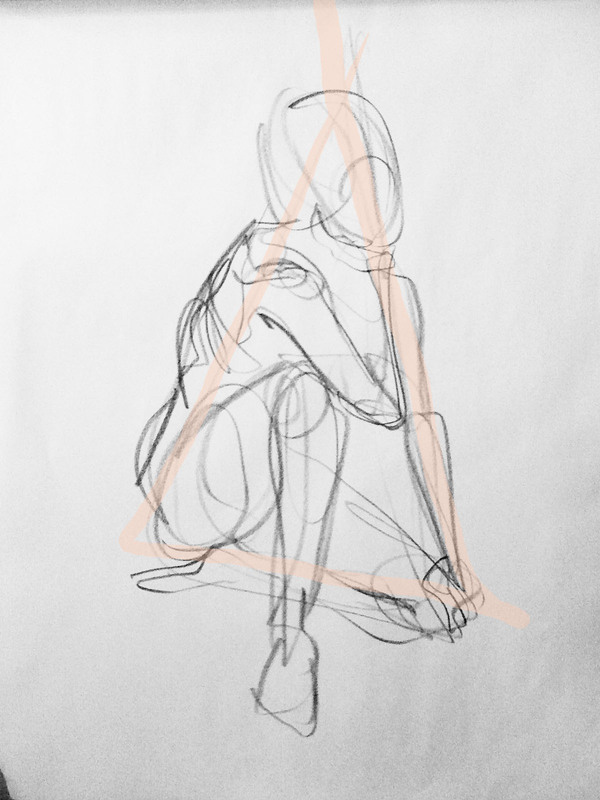 I do all this on a gut-level, not any kind of thinking or analysis... when the pose is only a minute or two long there's not really any time for that. 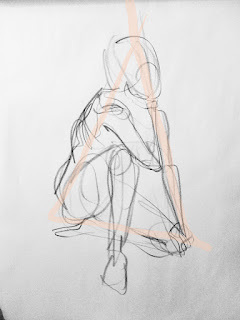 Once I am ready to draw, I spent a few seconds exploring the page and the pose, moving my arm over the paper although I might not start making marks right away. First I check how much room I have on the page, and where the edges of the page are compared to where the farthest out points of the pose are. Then I start with a light mark that will be the frame for the drawing. For the drawings on this post, I've highlighted the first mark I made on each page. Usually it's a swish of a line, the "line of action" as they say. As you can tell, this doesn't really correspond to the spine or to the centre of the figure. It's closest to being a description of the angles of the dominant masses of the figure. If the drawing was an essay, this first line would be the premise. It defines what the page is about. Once the first line is down, I start putting in lines that support the premise, describing the major masses, starting with the biggest ones and moving out from there. 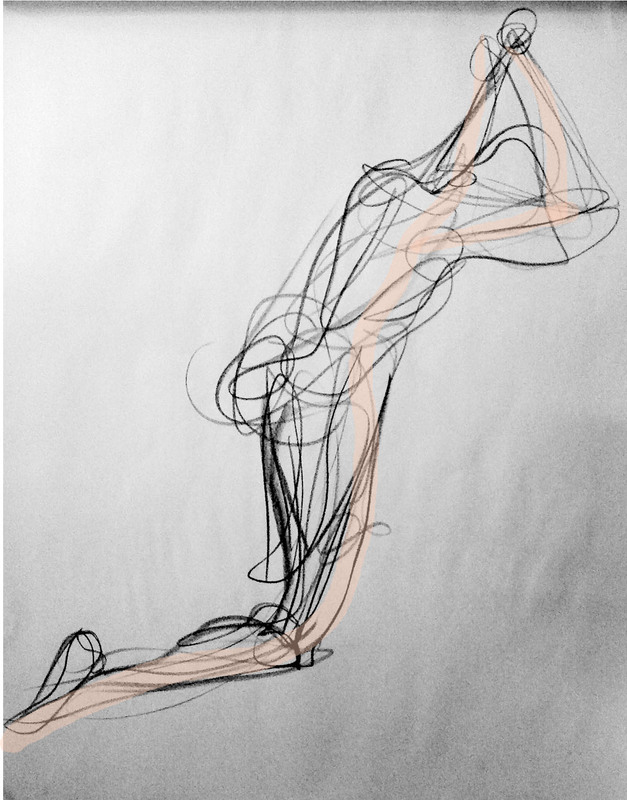 A gesture drawing is about the tension and energy of the pose. It's not about getting a likeness of the model, it's about getting the attitude they're showing. When you're doing gestures of a good model, then any one of them could be the starting point for a story. At least, that's the way I approach it. I'm not saying that there's a particularly right or wrong way to do it, just that this is how I do it, and it has worked out pretty well for me so far. See it, Feel it, Draw it. In that order - and that is the important bit. P.S. Check out http://holmesinccomic.wordpress.com/2011/08/22/gesture-drawings/ for an update to this post. Ta-Daaaa! It's a contest entry!